The best commercial style kitchen faucets are often determined by the design of the kitchen you have and also the various uses that you put your sink into. There are different models found in the market and it is always best to get one that matches your kitchen décor. This commercial style kitchen faucet review mostly features single handle kitchen faucets that have been found to look best in single-wall kitchens. They can also be used in double wall kitchens as they give the whole space a modern look. They help in providing control and also flexibility all of which are not derailed by a sink that is full of dishes or anything else that you intend to clean. Most single handle faucets will have a sprayer only but have options for the user to switch from high volume sprays to a steady stream of water when necessary. They also include hose protectors to protect the hose and also let it head in a particular direction. The flow control is managed by the lite touch single lever that is easy to do with one hand (Also check out touchless kitchen faucets reviews). The spring design is heavy duty and a commercial style used by the manufacturer. The chrome color makes it easily adaptable to your kitchen finish as it gives a modern look in the kitchen. 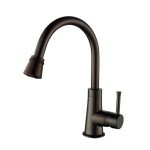 The water consumption for this commercial fusion style kitchen faucet is 1.8 GPM. It has a spout height of 28 inches and the spout reach is about 9.5 inches. The spout height makes it more convenient to use the faucet as it facilitates easy reach. It is deck mounted when installed and weighs about 1.3 pounds whilst measuring 28.5 x 9.5 x 28.5 inches. 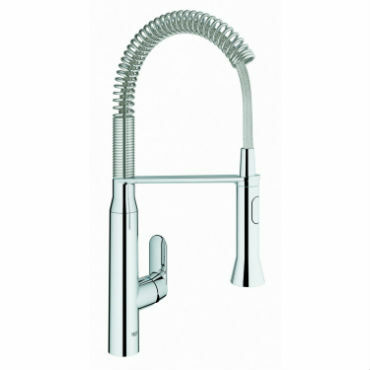 Kraus KPF-1602 commercial kitchen faucet is created using a low flow and high performance Neoperl aerator. Other than that it also features precision Kerox ceramic cartridge that allows for a drip-free use which is reliable. The side pot filler and the pull down spray head make it more functional in the kitchen. 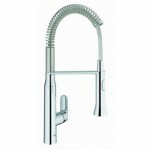 This Premier is a single handle kitchen faucet that features among the top rated commercial style kitchen faucets. The industrial style used to create it makes it ideal for residential kitchens. It has a pull down spout making it easy for you to be flexible in what you wash in the sink. The metal lever handle and the ceramic disc cartridge make this commercial fusion style kitchen faucet more reliable and durable as well as more functional in the residential kitchen. It also includes a deck plate. The finishing is of PVD brushed nickel that makes it rust resistant and also easy to maintain. This also ensures that it is exceptionally durable. This commercial kitchen faucet is certified to the NSF61-9 and is deck mounted during installation. It has a flow rate and water consumption level of 2.2 GPM. It also has one dispense hole and one handle. The model weighs 6 pounds and measures around 9.7 x 10 x 22.6 inches. You can switch from a steady stream of water to a high volume spray by pressing the button found on the faucet. The hose protector coil is also made of stainless steel that ensures no rust accumulates. It can be used on sinks with one hole or three holes. 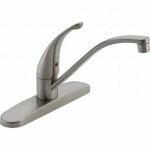 The Blanco 440557 Meridian is a semi-professional faucet that has a single handle. The color is satin nickel that requires a careful eye in order to match it with the kitchen and other appliances. It, however, helps to give the kitchen a modern look. The installation procedure requires it to be deck mounted and also to be installed in a 1 3/8 inch hole. The body of this commercial style kitchen faucet is made of solid brass which is a strong metal that makes it durable and reliable. You can be flexible in your sink usage as it has a pull down spray. It also has a ceramic disc handle and a lever handle for ease of usage and turning it on and off as well as controlling the water volume. Aside from the above features, it has a supply line that is extra long. The spout reach is 8 3/8 inches which is long enough for most kitchens. Other than that the aerator clearance is 5 3/8 inches. The flow rate, as well as the water consumption, has a high of 2.2 gallons per minute, though you can control the amount of water you use. It weighs 9.9 pounds and measures 6 x 6 x 6 inches. 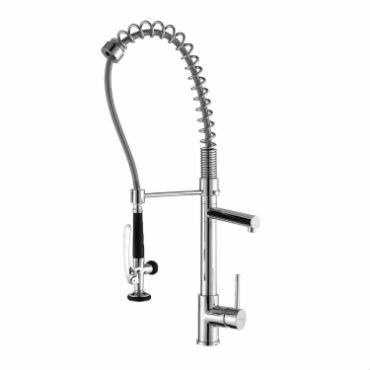 This pull down faucet model is a semi-professional style faucet that has a chrome color that easily adapts to most kitchen styles and helps modernize a traditional kitchen. 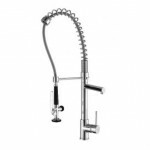 It features the Grohe Silk Move® which provides smooth operation for a long period. 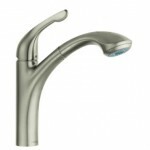 The model has a Grohe StarLight® finish that gives the model durable beauty and a classic and stylish look. The finish also makes it resistant to tarnish and rust or even scratches. Other than that it has a SpeedClean® anti lime system. This means that you are able to remove lime from it by simply wiping using the finger. This helps increase its performance and maintain the high performance even after usage for a long time. The pull out spray has a dual locking system. This facilitates you to be able to switch from a steady stream of water to a high volume spray easily and seamlessly. The model is made using brass which is strong and reliable. It is deck mounted during installation. It has a spout height of 5.8 inches and a spout reach of 9.31 inches. The cartridge is made of ceramic discs that are more durable as compared to plastic cartridges. It measures 30.3 x 12.6 x 27 inches and weighs 11.5 pounds. The Ruvati features in a number of commercial style kitchen faucet reviews and has a stainless steel exterior that makes its finish not only stylish but also rust resistant and not easily susceptible to tarnish. The construction is of solid brass that offers long lasting strength to the model and durability for years. The cartridge is made of Kerox ceramic disks that ensure usage is drip free that is a guarantee on saving water and also ensures the sink is not messy due to leakages. The height of the faucet is 28 inches; the spout height is 7.9 inches while the spout reach is 8.25 inches. It requires a single hole installation preferably one that is 1 3/8 inches wide. The spout has dual functions including an aerated stream spout mainly for regular use and a flexible spray spout mainly used while rinsing. The model also meets the requirement by the federal government for faucets to be lead-free. It also meets the Canadian and US industry codes. The flow rate is 2.2 gallons per minute. The faucet is extra-long to help you in installing it even when you have countertops that are above the average height. It also includes hoses for cold and hot water. 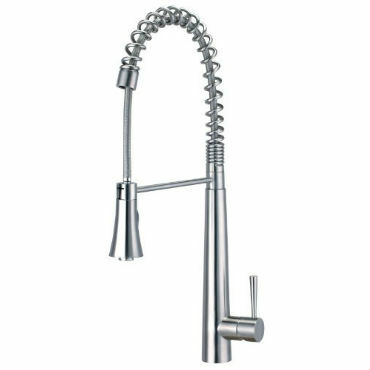 The ALFI brand AB2039S is a commercial kitchen faucet that has an arm and spring that is used to hold the spray head in place. The spray head can be pulled down when you intend to wash larger surfaces or needs near contact. The user can operate the control valve with just one hand. In order to control the pressure, you need to pull it to the right. To regulate the temperature you can pull to the front and push to the back. There’re blue and red dots on the faucets that indicate hot and cold water. This makes it easy to use the sink as one hand is free. 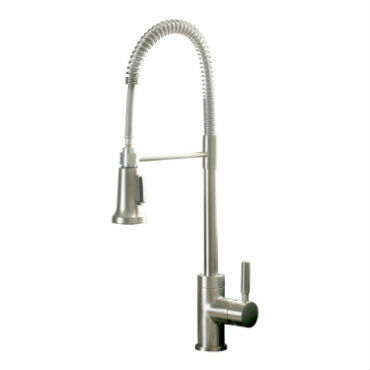 This commercial fusion style kitchen faucet is made using solid stainless steel that is a high quality material that provides a strong and long lasting faucet. Other than that it also ensures that the finish is not easily susceptible to tarnish, scratches and rust. The model requires to be deck mounted during installation and the hole diameter on the counter needs to be about 1 ½ inches wide. The product complies with lead-free federal regulation that makes it safe for domestic use. The product dimensions are 1 x 1 x 22 inches and it weighs 9 pounds. Kitchens can be termed as the basic social network of a home. In most homes, everyone gets in the kitchen at least twice each day. Giving the kitchen a modern stylish look is thus fundamental. Installing a good commercial fusion style faucet that not only ensures exquisite functionality but also a stylish look is always the best way to go. When buying one, you may need to consider various things. Limitations – Your current kitchen setup may influence the type of commercial style kitchen faucet that you can get. Before getting one it is important to find out the types of kitchen faucets that would fit with your current setup in order to choose from there. You may need to measure the distance on the sink that you wish for your new faucet to cover. You also need to measure the distance between the backsplash and the place of your current faucet’s installation. This will help know the type of handles to look for and also the space you will have to maneuver. Aesthetic design – You need to consider the design aesthetic you want and then find models that best bring out the said design aesthetic. You may be looking for a contemporary design, a modern look, a farm look or even a traditional design. You should also consider the other appliances in your kitchen and the look that would blend in well and also best compliment the current look in your kitchen. Utility –Many people ignore this factor when looking to replace or install a new kitchen faucet. 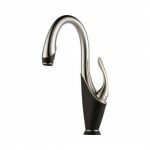 Looking for a stylish commercial fusion style kitchen faucet and one that gives your kitchen a good feel is a great consideration but you may also need to look for one that performs its functions well and also makes it easy to use. It is always best to go for utility over looks instead of the other way around. Special features – Special features always mean that the model has extra functions or has features that make it easier and more convenient to use. You should look for this as it may be difficult to install special features after the original installation has already taken place. Don’t overlook the special features, especially those that you find fundamental for your kitchen due to the functionalities it provides. Looking for the best industrial kitchen faucet is a simple task as long you know exactly what you need and are looking for. You should also consider the type of installation needed since a one hole kitchen may fit in a three-hole design but not a two hole. Modern homeowners are spoilt for choice when it comes to interior designing. From the living hall to the bedroom, to bathroom, to kitchen, there are many different designs and styles to choose from. 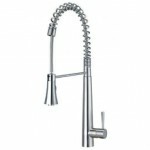 One of the things that are becoming more popular is the commercial style kitchen faucets. 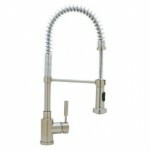 You may have seen this type of faucet in an industrial kitchen or the kitchen of a restaurant. It has a distinct look where the spout is arched and there’s a spray hose with coiling wires around it. While it may look modern and gives your kitchen a touch of professional cooking, are commercial style kitchen faucets beneficial? Here, we’re going to talk about the benefits of commercial style kitchen faucets so you will have a better idea on its advantages before installing one in your kitchen. Longer hose – While a typical pull out kitchen faucet also has a long hose, commercial style kitchen faucets often have a longer hose. Ranging from 22 inches to 28 inches in length, you can extend this hose to suit your cleaning need around or away from the sink basin. 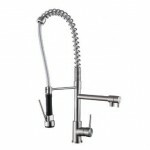 Material – Commercial style kitchen faucets are often made out of durable material such as solid brass or full metal. If you’re someone who cooks very often, then you would know just how many times you would use the faucet in just one day. 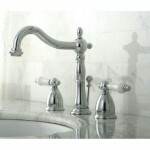 This and also the wear and tear of faucet come into play when considering its durability. Water flow and pressure – Many commercial style kitchen faucets are pre-rinse, where the water pressure is slightly higher than the average faucet. This helps, amongst it, to get food off plates easily for cleaner and smoother cleaning. Before purchasing one, you can enquire about its GPM (gallon per minute) rate. 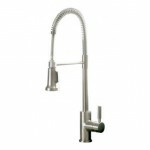 Some commercial style kitchen faucets have a water flow of 1.8 GPM and some at 2.2 GPM. One of the benefits and sparks of being a homeowner is that you get to decorate each aspect of your house as you see fit. This means that you can upgrade your kitchen by getting the best commercial style kitchen faucet that will complement your kitchen. Most people often go for a look that reflects their personality. The kitchen is often a crucial part of any home upgrades as kitchen appliances keep evolving as time goes by. The appliances are often designed to last long and thus an upgrade doesn’t mean that the current appliance is not functioning. Thus when getting a kitchen faucet to improve your kitchen you need to go for one that provides more functions for you as compared to your current one. In order to find the best, you may need to browse several commercial style kitchen faucet reviews so as to see the different specifics for different models.